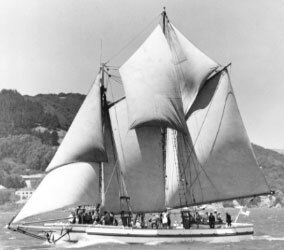 The historic schooner, The Alma, will be docked at Angel Island this Friday and Saturday. Fred Siemer, a German immigrant, constructed two scow schooners. Siemer named the first after his daughter, Adelia. The second one built at Hunter’s Point was named after grand daughter Alma in 1896. Alma’s construction was not unique, but it was unusual; her bottom planking was laid athwartships (side-to-side) instead of fore-and-aft. Called “log built” because the horizontally-laid planks were quite thick, scows like Alma traded a bit of speed and ease-of-repair for economy and strength. Alma hauled a wide variety of cargoes during her career. She carried hay and lumber under sail, and after Peterson removed her masts in 1918, she freighted sacks of Alviso salt while being towed as a barge. Frank Resech, who purchased the vessel in 1926, installed a gasoline engine in her, and from then until 1957 her cargo was exclusively oyster shell – carried in a 22’ by 36’ wooden bin installed on deck. A number of sailing scows ended up as oyster shell dredges. The shell was free for the taking and vast deposits lay in the San Francisco Bay. Both Resech and his wife lived and worked aboard Alma for a time; Mrs. Resech handled the steering while her husband operated the dredging machinery. During those days, Alma hauled 110-125 tons of shell per week to Petaluma, California, where it was ground and used for chicken feed. In 1943, Resech sold the vessel to Peter John Gambetta, who continued to operate her as a dredger until 1957. When Gambetta retired Alma she was still seaworthy, but no longer profitable. The State of California purchased Alma as she lay on the Alviso mudflats in 1959, and restoration work began in 1964. She was transferred to the National Park Service in 1978, and designated a National Historic Landmark in 1988. Alma is now part of the San Francisco Maritime National Historical Park’s fleet of historic vessels at Hyde Street Pier. She sails every season, and participates in the revived Master Mariners Regatta every May.